Jonathan Hess, professor and chair of the department of Germanic and Slavic languages and literatures, passed away suddenly on April 9. Hess had been department chair since 2016 and the Moses M. and Hannah L. Malkin Distinguished Professor of Jewish History and Culture since 2012. He had served as director for the Carolina Center for Jewish Studies for 10 years, building it into one of the premier Jewish Studies programs in the country. Hess was a renowned scholar on German cultural, intellectual and literary history from the 18th century on, with particular interests in both German-Jewish studies and the legacy of the Enlightenment. He was the author of four books and numerous peer-reviewed articles on Jewish-German culture, politics and anti-Semitism. 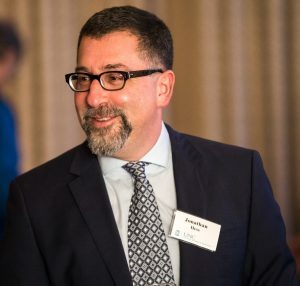 Hess’ other service to the university included being a member of the Advisory Committee on Undergraduate Admissions and representing the College on the Appointments, Promotions and Tenure Committee. He served on Faculty Council from 2009 to 2013. He had been a member of the Carolina faculty since 1993, joining it immediately after earning his doctorate in comparative literature and literary theory from the University of Pennsylvania. To honor Hess’s commitment to supporting junior scholars and cultivating future faculty leaders, memorial gifts may be made to the Jonathan M. Hess Career Development Term Assistant Professorship in the College. The fund will support a term professorship for a tenure-track assistant professor in the fine arts and humanities. Click here to make an online gift.